Subscription and services sales are up, but revenue in this division is slumping. Investors have punished FireEye's (NASDAQ:FEYE) stock this year as its growth pace sinks against a backdrop of net losses. The cybersecurity specialist, which aims to disrupt the industry with a package of next-generation threat protection, is struggling to convince enough IT managers to commit scarce resources to its virtual-machine-based platform. I recently highlighted FireEye's biggest win of the year -- its sharply falling expenses -- and today I'm taking a closer look at the greatest drag on its operations: product sales. The product business segment is down 18% through the first six months of the year and lopped $9 million out of second-quarter revenue. In contrast, FireEye's subscription sales rose by $28 million in Q2, its support sales improved by $8 million, and its professional services segment ticked up by less than $1 million. Rival Palo Alto Networks (NYSE:PANW) is faring much better on this metric. Product revenue improved by 24% last quarter which, combined with a 62% spike in subscription revenue, produced 41% higher overall revenue. 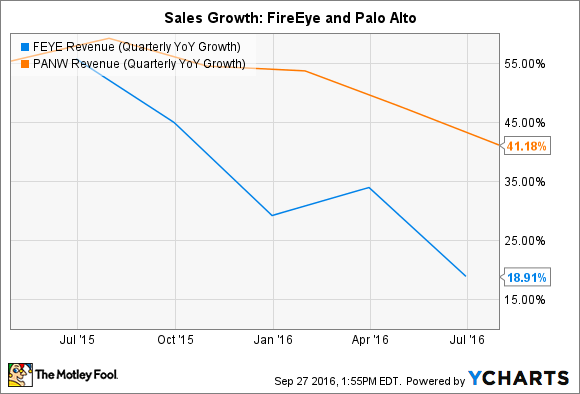 FireEye's total revenue growth, in contrast, was a disappointing 19%. Strip out the gains from the company's recent purchase of iSight and the result is even worse, as organic revenue improved by just 11% in the quarter. FEYE Revenue (Quarterly YOY Growth) data by YCharts. Executives said in a conference call that the latest product revenue slump was related to lower tech fees, along with a decline in sales for its email product, as customers instead opt for its cloud-based email security subscription offering. That trend is likely to continue, and so FireEye isn't forecasting a rebound in the product business this year. In contrast, Palo Alto projects its product sales to rise by 12%, with continued solid growth in 2018. On the plus side, though, FireEye did manage a slight uptick in profitability for the product division. And that boost contributed to surprisingly strong earnings in its fiscal second quarter. Overall operating margin was still deep in negative territory, but it marked the company's best performance on that metric since the third quarter of 2012. There are a few big benefits to FireEye's business shifting toward subscription services. For one, the company is growing an established sales base that it can work to renew rather than look entirely at incremental customers for extra business. As a result, the company might not need to direct as much cash toward marketing, leaving more for the important task of innovation around product improvement. Second, renewal rates are above 90% and have spiked to represent 20% of the sales footprint (from about 10% a year ago). These positive trends combine to produce a steadier and more predictable revenue and profit stream -- one that is likely to become even more so in the future. As the stock price drop demonstrates, investors aren't happy with the overall direction of FireEye's business. But neither is the company, which recently installed a new CEO in hopes of reigniting sales growth. FireEye's new leader, Kevin Mandia, is focused on building out its security platform to provide a comprehensive solution that covers everything from threat detection to neutralization. The company doesn't need robust product sales to lead the way toward this goal. Still, it's likely that a rebound in this division -- in addition to faster billings growth on subscription sales -- will be needed before Mandia and his team can claim that a real recovery is under way.